200% Cashback On Jio Recharge; BSNL Launches New 4G Plus Plans! Jio is offering the cashback in the form of vouchers and in select digital wallets. BSNL has revised its existing plans in addition to launching some new ones. Reliance Jio is again back with a new cashback offer, where users can get up to 200% cashback on every minimum recharge of Rs. 398/-. The offer will be valid on all recharges done until 15th February. The cashback is divided into 2 parts. The first cashback will come in the form of eight vouchers of worth Rs. 50/- each on all recharges done through the MyJio app for Rs. 398/- and above. The next part of the cashback offer will be an instant cashback of up to Rs. 399/- for some selected wallets, depending on the wallet you chose. The participating wallets for the 100 percent offer are MobiKwik, PayTm, PhonePe, Amazon Pay, Freecharge and Axis Pay. MobiKwik wallet is offering Rs. 399/- cashback with code JIOFULL. Amazon Pay is offering Rs. 50/- cashback, Axis Pay is offering Rs. 100/- cashback, PhonePe is offering Rs. 75/- cashback, Paytm is offering Rs. 50/- cashback and Freecharge is offering Rs. 50/- cashback. Apart from the 200% cash back, the recharges done via MobiKwik wallet will also receive a voucher worth Rs. 2,500/- for hotel bookings. If you are making the payment via Paytm you can get a 50% cashback up to Rs. 150/- on first-time movie ticket booking through Paytm. You can immediately redeem both, the cashback voucher and the wallet balance after recharging the Jio number. This offer is only valid for Jio Prime subscribers. 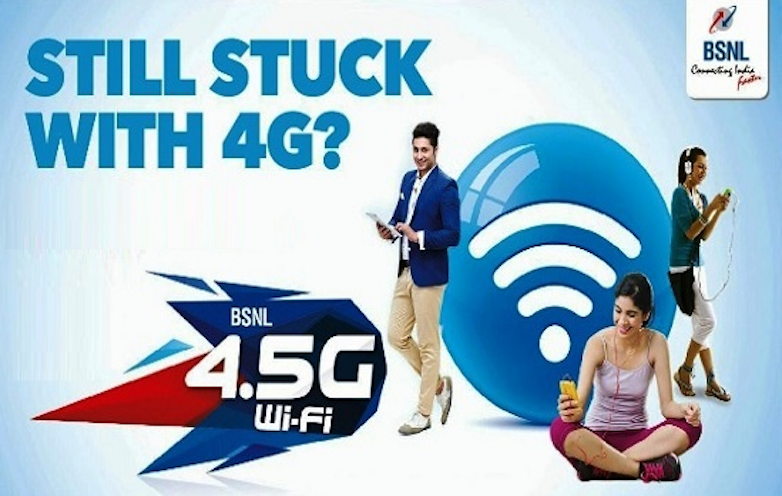 The state owned telecom operator has revised its 4G Plus tariff plans, and now allows a user to connect to any BSNL WiFi Hotspot that is available in the vicinity. Plus, BSNL has revised their existing plans with three new 4G Plus WiFi plans. The revised plans from BSNL now offer more data benefits. The BSNL 4G Plus WiFi plans now start at Rs. 10/- and go all the way up to Rs 1,999/-. The data benefit starts from 300MB in the entry-level plan, to 150GB in the premium plan. Among the newly launched plans, there is the BSNL WiFi 50, BSNL WiFi 90 and BSNL WiFi 500. The Rs. 50/- plan offers 2GB of data for 14 days, the Rs. 90/- plan offers 4GB of data for 28 days and the Rs. 500/- plan offers 30GB of data for 28 days. The 4G Plus WiFi plans start at Rs. 10 with 300MB of data offering a one-day validity. Up next there are 4G Plus WiFi plans of Rs. 20/-, Rs. 30/-, Rs. 40/-, Rs. 60/-, Rs. 75/-, Rs. 80/- and Rs. 100/-. The Rs. 20/- plan offers 500MB of data for 3 days, and the Rs. 30/- and Rs. 40/- plans offer 1GB and 1.5GB of data respectively for 14 days. Among the premium plans, BSNL has the Rs. 999/- and Rs. 1,999/- plans which offer 75GB of data, while the Rs. 1999/- plan offers 160GB of data. Both the plans come with 28-day validity. At present BSNL is in the process of adding more 4G Plus WiFi hotspots across India. The BSNL 4G Plus WiFi vouchers will be soon available to all the subscribers (prepaid and postpaid). BSNL postpaid users can use the BSNL Broad Fi which allows the BSNL postpaid customers to enjoy free data from BSNL hotspots. "200% Cashback On Jio Recharge; BSNL Launches New & Revised 4G Plus Plans! ", 5 out of 5 based on 3 ratings.